Treat yourself to a day to remember forever. 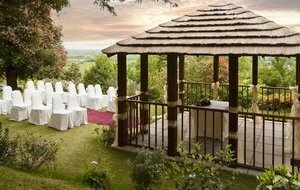 A wedding at the Webbington Hotel and Spa is a truly memorable experience. Picture yourself arriving in your special car, making a wish as you cut your cake and being embarrassed by the Best Man’s speech. You can choose between a daytime or evening reception. We can provide our resident disco and why not take advantage of our special rates for wedding accommodation for your guests here at the Webbington Hotel and Spa – we really are the one of the best wedding venues in Somerset! Plan the event from our luxury spa. We offer one month’s free leisure club membership for both brides and grooms. Have a peep at our honeymoon suites and ask about our special offers. Our dedicated Wedding Team are happy to help with any of the stages of planning your special day. We can recommend suppliers and offer ideas such as themes, entertainment and much more! Civil marriage ceremonies for the solemnisation of marriages are available any day of the week together with Bank Holidays – at the discretion of the Superintendent Registrar at Somerset Council. Not sure which district you’re a part of for wedding ceremony services? Click here to find out! End your idyllic day by retiring after the celebrations are complete to the delightful Honeymoon suite – all included as part of the special wedding package. The Webbington Hotel has its own unique atmosphere specialising in personal service together with caring and attentive staff and offers you a warm and friendly welcome. We hope to be part of your very special day. If you would like to download a copy of our Wedding Brochure, please click the link above, alternatively why not book a personal one-to-one show around at our venue with our wedding team – find out more here. We are also able to provide late availability with exclusive use dates throughout the year – check these dates here. 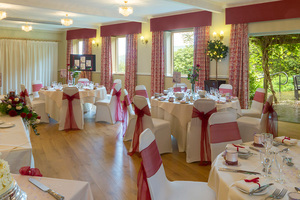 When looking for wedding venues in Somerset, the Webbington Hotel has it all. Want to know more or looking to book a show around? Please leave us your details and we'll be in touch. "Just had my wedding there, wow! The staff are great and can never do too much for you! The day flowed perfectly." "We had the most wonderful day and you played a very large part in making it so special." "It was flawless and just perfect. We really can’t put into words how pleased we are and so happy we chose the Webbington for our venue."